I admire the work that Carol Diehl, Sharon Butler, and Joanne Mattera, (among others) do on their blogs. They visit galleries and the big art fairs, photographing and reporting on what they see. They are a lifeline for people like me, who don't live close to the big art centers, but need to keep up on what's going on in the larger art world out there. 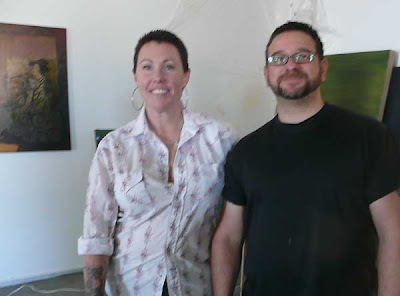 So, last weekend was the Tuscon Artists' Open Studios, a twice yearly affair, with more than 140 artists in over 89 locations all over the city. My (admittedly vague) intention was to do what others do so well on their blogs–document and comment on what I saw in Tucson. Jim and I got off to a rip-snorting start on Sunday, not managing to get to Tucson until 2 pm. Our first stop was the Citizens Art Studios, on West 6th Street. An old warehouse, it is the recent home to several galleries, including the venerable Dinnerware Artspace. Two newer galleries, Fragment and Central Arts have also made their homes at Citizens Art, as well as a number of artists who have studio spaces in the building. 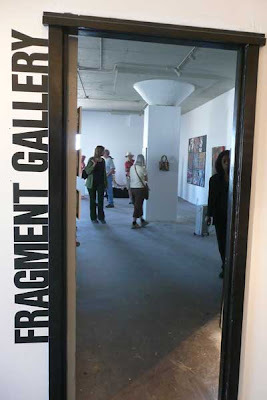 Fragment Gallery had just barely finished moving into their new space. 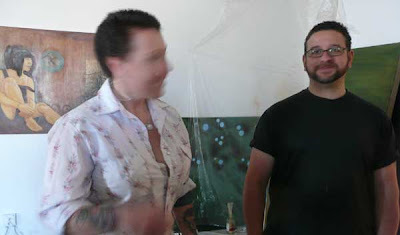 Shown here are Amy and Mark, co-owners of the gallery. First mistake, I forgot to ask their last names. They don't have a website yet, so I can't list it here. You see Amy in motion, and I have a feeling that's typical of her as she seemed brimming with energy. Here they are again, with a glimpse of artwork behind them. Yes, I forgot to get the names of the artists in the gallery, not to mention to photograph some of the work, up close. This is Matthew Diggens. He has a beautiful studio just down the hallway from the Fragment Gallery. He, also, has just recently moved in. 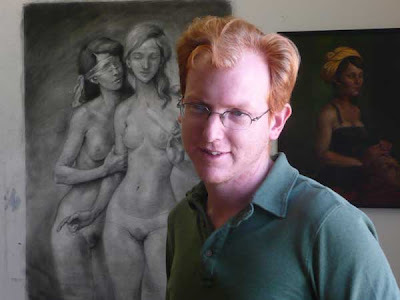 You can see several of his pieces behind him. In addition to his paintings and drawings, he has written and illustrated a childrens book Andrew and the Secret Gallery, published by Red Cygnet Press. I'm pretty sure I asked him about a website for his work and he told me he didn't have one. Well, that's it. I really meant to continue on. Just in this space, I could have taken photos (well, gotten Jim to take photos) of the new Dinnerware Artspace, and plenty more. I just plain got distracted and quit. My excuse is below. 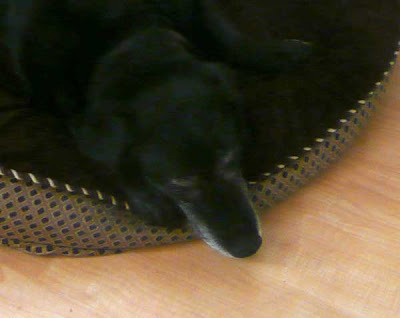 Breena, the depressed and neurotic, yet beloved dog, was with us on this jaunt. She weighed heavy on my mind as we left her in the car to visit studios and galleries. She was perfectly safe. She had a lovely dinner, walk and poop in a park. It wasn't too hot in the car. Yet she was miserable to be left behind and I knew it. I returned to Oracle with a renewed admiration for the people who manage to visit, photograph and document, then post their findings for others to enjoy. It takes planning, organization, note taking, concentrations and lots of plain hard work. Maybe I'll try again sometime, but for now, I plan to keep enjoying the fruits of others labors.